The AF3P 11-E is 11" wide by 9" deep and has unique functionality compared to other kilns of it's size. 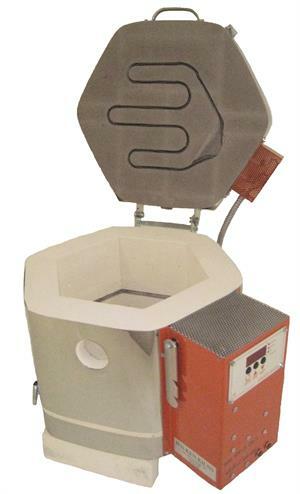 This kiln can hold a 10" plate mold or an 8" square mold. The added depth can expand your contemporary warm glass to include pot melts, pattern bars and some nice size drop-outs. Both top and side firing with a 3” viewing window built into the side. This kiln is great for instructional workshops. Operates on a dedicated 120 volt 20 amp circuit and is controlled by Jen-Ken kilns exclusive pre-programmed Orton Digital 3-key controller. This controller has over 20 different firing schedules as well as many blank slots for those users that want to design their own firing schedules. All programs are easy to edit so you can fine-tune your controllers results.